The owners of Combat Flip Flops appeared on an episode of ABC’s hit series, Shark Tank. Did they survive? This article first appeared in The Havok Journal on 31DEC15. It sounds like a rather ambitious plan when you isolate this section of a Ted Talk delivered in Tacoma, Washington earlier this year, until you realize from whom it’s coming from. Not a freshman in college big on ideas and short on reality. Not a bureaucrat from within the State Department looking for a good PowerPoint slide for the next ‘how to fix Afghanistan’ presentation. Certainly not from a politician pitching his platform to voters looking for hope and weary of conflict. No, it came from a former Army Ranger-turned-entrepreneur. All of a sudden, the idea doesn’t seem so far out of reach. 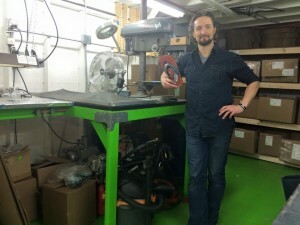 Griff in his shop, showing off some of his latest products. Matthew “Griff” Griffin is the CEO and co-founder of Combat Flip Flops, a for-profit company with a very important social mission. He’s a 2001 United States Military Academy graduate who was commissioned as a Field Artillery Officer. Between 2003 and 2005, Griff deployed four times to Iraq and Afghanistan with 2nd Ranger Battalion as a Company Fire Support Officer, planning and participating in over one hundred special operations direct action missions. After departing from the military in 2006, Griff worked in the defense sector, where he discovered economic stability was the solution to curtailing conflict and instigating an environment ripe for healing and rebuilding. Along the way, they gave them more than just jobs though. They instilled a sense of hope in a region that has had to choose between the frying pan and the fire for the better part of forty years now. 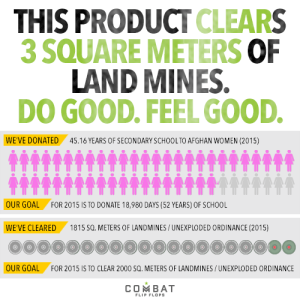 They even saw the change they were effecting first hand with frequent trips to their factory in Afghanistan, not letting the danger of such trips deter them or their mission. There have been many challenges along the way though, not the least of which was figuring out a logistically efficient way to get around red-tape surrounding importing products into the U.S. that were manufactured in an active combat zone. Rangers gonna Ranger though, so they figured it out and haven’t slowed down. They have moved their flip-flop operation to Colombia, aiding in the recovery of a post-conflict country riddled by civil war and drug cartels, even helping push the establishment of a free-trade agreement between the U.S. and Colombia. They are manufacturing sarongs in Afghanistan; each one pays for a week of secondary school for a young girl. They make bracelets in Laos; each one made is responsible for clearing three-square meters of unexploded ordinance in the country. The best part of all of this? The products themselves are of impeccable quality. The sarongs are individually hand made, taking three days from start to finish. The flip-flops are made of real cow leather and, depending on which pair you buy, come adorned with used ammunition brass. Those bracelets that help de-mine Laos? Yeah, those are hand made from actual unexploded ordinance by local artisans. It’s all well and good to talk about how much social change a company is responsible for, or how good their products are, but it is also prudent to look at whether all of this is actually good for business or not. Combat Flip Flops hasn’t disappointed, with over 150% growth from 2014 to 2015, and a fledgling mobile sales program that has expanded to locations in Virginia Beach, VA; Fort Wayne, IN; and Dallas, TX. They have even expanded their team, with a total of six people working under the CFF banner and an impressive line-up on the board of advisors. As this company moves forward, it’s only inevitable that gaps in the U.S. foreign policy will be filled slowly but surely. They are still a small business, yet are effecting change on such a high level. I can only imagine what they will be able to accomplish as they ascend the retail ladder. Many point to the faults of capitalism and the free market in an age of increasing education and health care costs. Many point to the failings of U.S. foreign policy in regards to the current wars in the Middle East. As for me? I point to Combat Flip Flops. I point to what motivated veterans can accomplish for the world when they put their mind and efforts towards an important mission.